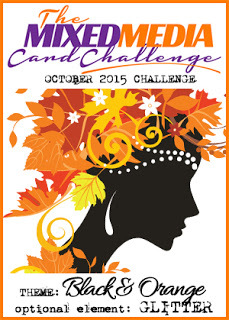 If you are looking for my Fusion Challenge post - please scroll down or click here. 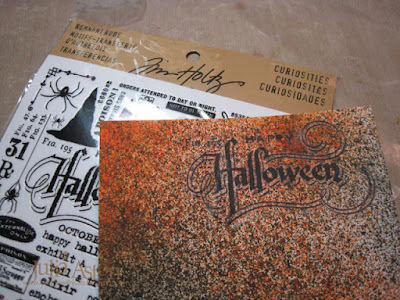 Welcome to October 1st and the new Mixed Media Card Challenge - Black and Orange with the optional element: Glitter. I've been in the Halloween mode for the last couple of weeks - so that is what I used for my card theme. The owl is from a wonderful stamp set from Waltzingmouse called A Great Big Owl - and he is, isn't he??!!! Let me show you how I put this together. 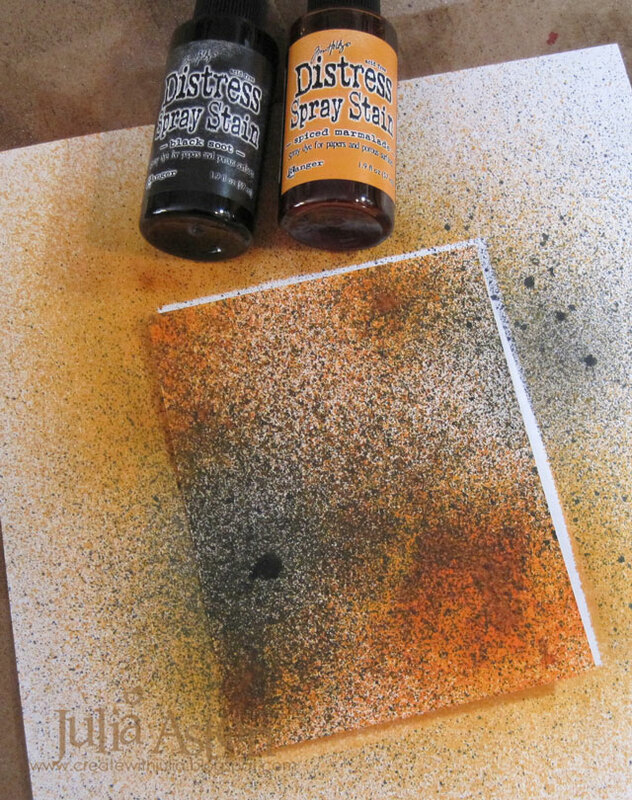 First I sprayed a panel of watercolor paper with Spiced Marmalade and Black Soot Ranger Distress Spray stains. I sprayed the orange first, dried it with my heat tool and then added the black so I wouldn't have TOO much black. 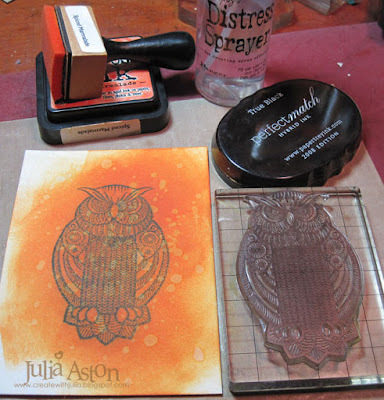 I stamped the owl onto white card stock, sponged over it with Ranger Distress Spiced Marmalade ink, then flicked water on it to create water spots. Distress Ink is waterbased and so will react with water. 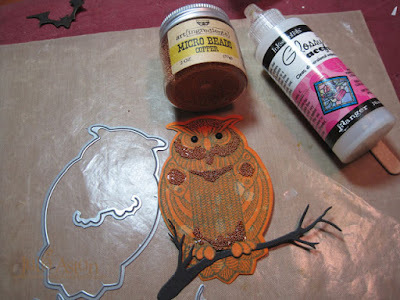 I die cut the owl, his feet and the branch with Big Owl die set from Waltzingmouse. The little die that cuts around the 'toes' of the owl allows you to perch him on the die cut branch (how clever!). I also added some Copper Micro Beads on a few spots with Glossy Accents. I added a Happy Halloween Remnant Rubs/Curiosities to the top of the stained panel. 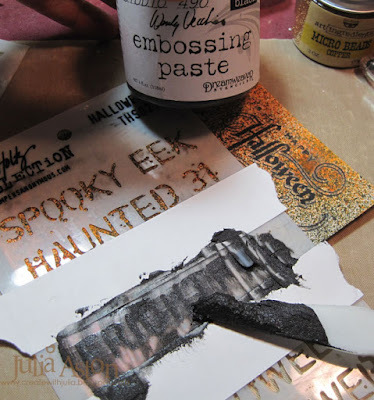 And stenciled 'FRIGHTFUL' using Tim Holtz Halloween Stencil - masking the word I wanted and using Wendy Vecchi Black Embossing Paste. I added a die cut bat to the top corner with a foam dot. A close up of the Copper Micro beads and the black rhinestone eyes. 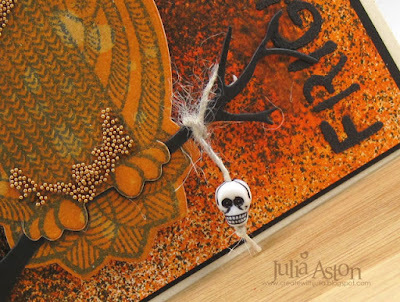 I looped a piece of twine through a tiny skull charm (another free gift received with a Funkie Junkie order) and tied it to the tree branch - for a little added 'frightfullness!" Spooky/cute right??! 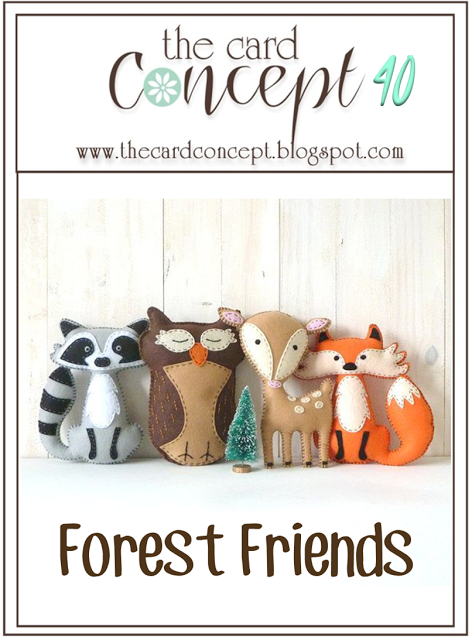 Please check out the Mixed Media Card Challenge blog for all the challenge details and some pretty awesome inspiration from the rest of the Design Team!! How will you be inspired by Orange and Black??? Can't wait to see!! Accessories: Micro Copper Beads - Finnabair Art Ingredients, Black rhinestones - Kaiser, Halloween Stencil -Tim Holtz, Black Embossing Paste - Studio 490 Wendy Vecchi, Glossy Accents - Ranger, Idea-ology Remnant Rubs/Curiosities, Big Owl Die Set - Waltzingmouse, foam tape, Skull, twine and bat die - Funky Junkie Boutique. Wow! Wow! Wow! Julia this is over the top amazing! 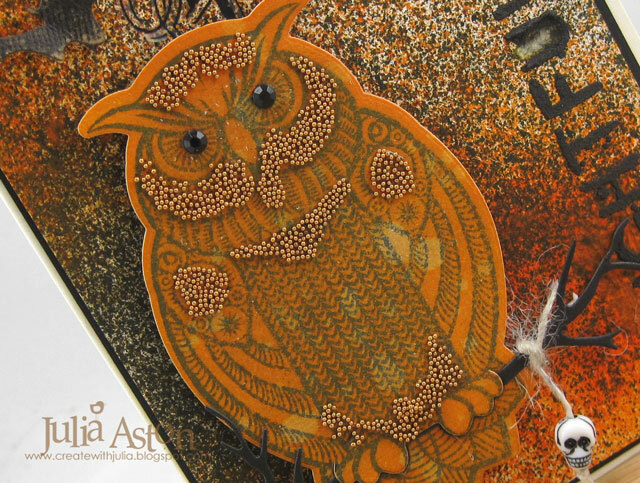 Love the background and your owl with the beading is so inspired! LOVE! Great textures and inkiness, love your owl. Wow! Just love what you've done with the colour combination, Julia - the spatters and layers give the whole thing a great patina and depth. Wonderful owl too! Oh.My.Gosh! This is frightfully delightful! I love all the details - too many to count! But the dimensional "schtuff" on the owl is just perfect! Well Julia, you've done it again... gorgeous!!!! Adore that you listed every step for your fans. We need to know how the uber talented do it! I just love this owl. So glad the season's here to use it again. Your owl would be a scary one, but he's too darn beautiful! I agree with the others- this owl card is spectacular!! Thanks for showing all of the steps to create this beauty and for sharing with us at The Card Concept!! Wow! That owl is so cool. Love the micro beads! 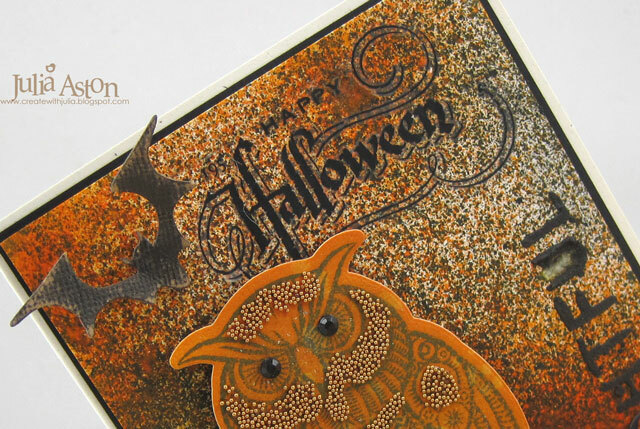 Beautiful Halloween owl! I love all these terrific details and doodads! Wow! Thanks for playing along with us over at The Card Concept! Thank you for joining us at The Card Concept! Hope to see you again!